I'm almost there. I can hear those discount sales calling my name! lol. I have now emptied 6 out of 10 products for the 10 Empties Challenge. 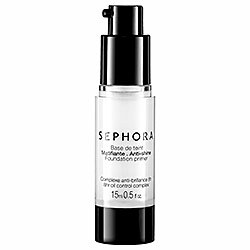 The latest empty is the Sephora Collection Anti-Shine Foundation Primer. I LOVE THIS STUFF. Prior to this I had used a spray on primer and a silicone based primer. Both were o.k. but not the best. This is the best primer I have used. I get VERY shiny fairly easily and this combined with the Make Up ForEver HD Microfinish powder help me stay less shiny longer, but I don't think I'll ever find something to keep my face matte all day. While I do have other primers I need to finish, I don't have to contemplate buying this again because I already have a second tube lol. I love the Make up Forever line and love this primer. I may need to do a review of it as well. Great post and shared it on twitter. I think they are like the perfect combination! Because they're packaging is the same color I thought they were the same brand until I read closer lol. Thanks for sharing! good job! you're really doing this! Good to know...in case I decide to really get into makeup. Thanks for sharing!